Cambridgeshire’s Police and Crime Commissioner Sir Graham Bright met shoppers and city workers this week in a ‘street surgery’ event to strengthen links between police and the public. 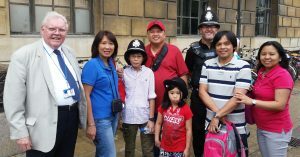 The Commissioner spent time chatting to local people in Cambridge’s market square and finding out how they feel about policing and community safety in their neighbourhoods. Accompanied by police officers from Cambridgeshire Constabulary, Sir Graham talked one-to-one to residents about any issues that concerned them. Like previous engagement events, many highlighted parking on pavements, cycling on pavements and bike theft as issues that needed to be addressed in their local area. “I really enjoy going out and about and meeting the people who are affected by our policing decisions,” said Sir Graham. “Policing is a public service and it’s vital that we keep this two-way interaction going so we better understand public expectations and can proactively address the issues that cause fear or reduce quality of life in the city. The event was one of a series being held in different towns and cities across the region as part of the Commissioner’s engagement work.